A production log of all the files inside the production is created. This log links to the file location in your case, shows you the Bates range and indicates redactions. The production log is interactive and has built-in filters. 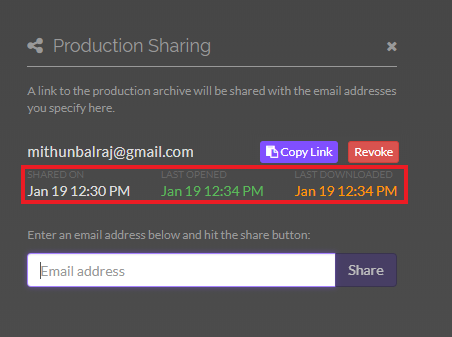 By using the share link, you can inform the production recipient that the production is ready for sharing. The recipient can choose to download the file from the link or create a new GoldFynch case with the contents of the production. You can copy and paste the link, all you need to do is provide a name for the share link, or you can email it via the GoldFynch. 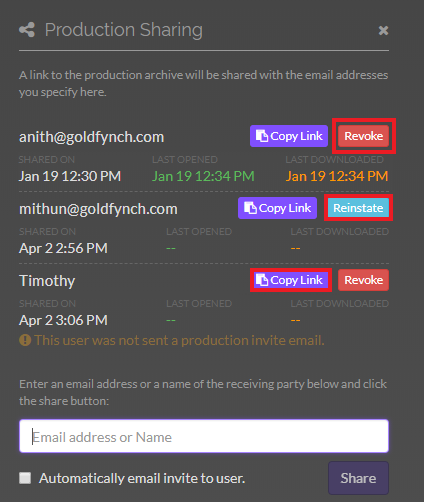 If you email it, GoldFynch will send an email on your behalf with the link to the production. Don’t want to share it via email? Click the revoke button on the right of the email address. Her link becomes invalid, and she won’t be able to download the production file. This also revokes access from those accessing the case directly through a share link. This can be undone by clicking on the Reinstate button.